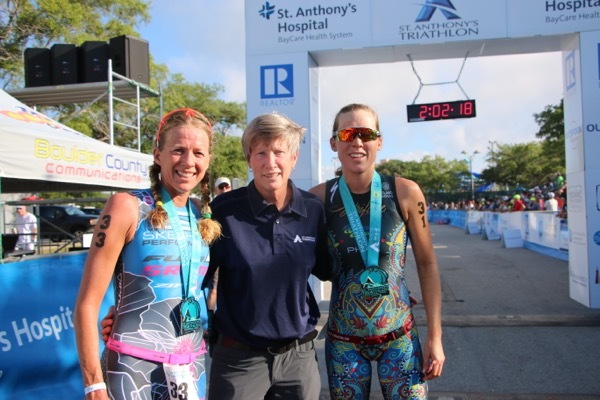 This past weekend I was excited to race my eighth attempt at the St. Anthony’s Triathlon. This is the 33rd year of this race. It is one of my favorite races of all time. 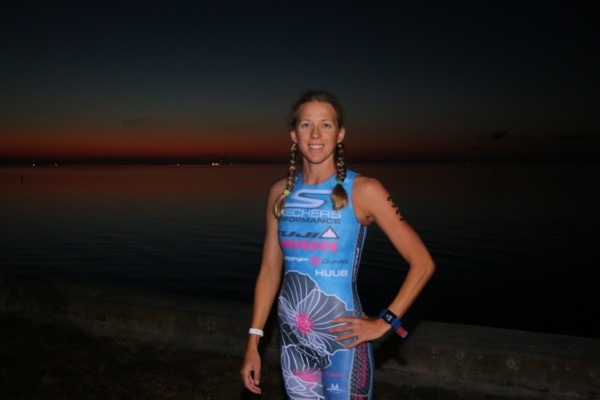 With an ocean swim, a smooth and fast bike and a fast run; this race course is one of the best. The trip began with an easy 90 minute drive down to St. Pete from my home in Clermont, Florida. 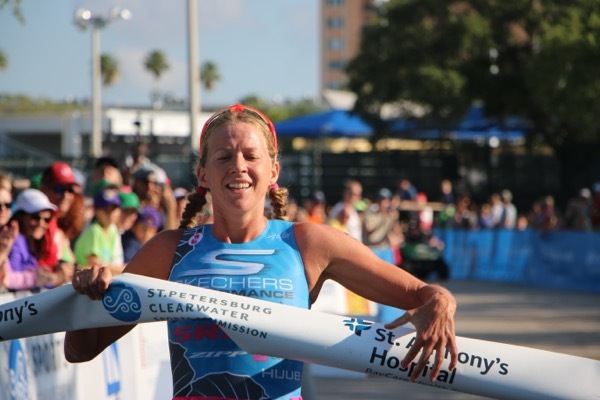 The weather has been perfect the past few weeks in central Florida, and continued all throughout race weekend. When Nate and I arrived, we enjoyed a nice walk through downtown and looked at the old Banyan trees and all the impressive yachts in the marina. 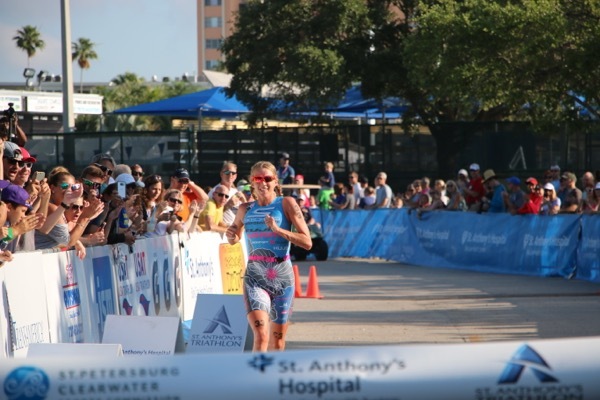 I felt so relaxed and just relieved that I finally did not have any illness or mild cold leading into the race. On Saturday, Nate and I did a pre-race ride/run through the golf course section of the race course and I did a swim in the ocean near swim start. The water was gorgeous. It’s the first time I remember water so calm and so blue. On the way back to the hotel, we stopped at the expo at the ISM tent and T1 race belt booth. It was nice not to be boiling in the Florida heat the day before, but enjoyed a nice, 80 degree, non-humid day. Race morning I woke up a bit groggy at 4:45AM, but within ten minutes was getting ready for the race and by 5:30AM was out to door to ride the short 1/2 mile to transition. The women went off at 6:53AM, just three minutes after the men. 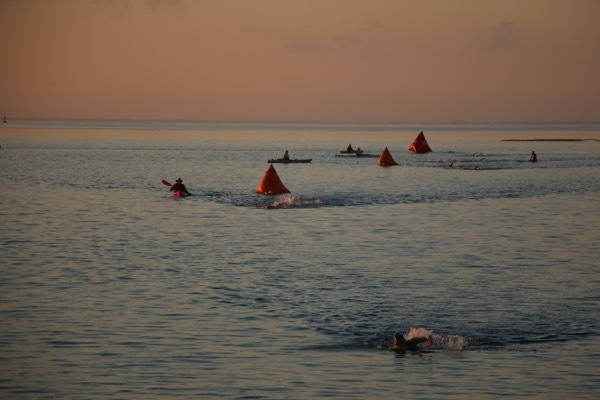 I had a good start and felt smooth and strong swimming to the first turn buoy at 800 meters into the swim. I made an error at the first buoy and did not realize how hard of a left to make and started swimming a little off course. Fortunately, I saw the kayakers in front, shouting and waving at me. I probably swam an extra 20 meters, but it was not enough too make too much of a difference. I lost the lead, but still ended up exiting in second position and felt comfortable and was ready to transition to go hard on the bike. For the swim, I used was my newly designed Triflare Sarah Haskins Poppy Race Suit, the HUUB SKN-1 Triathlon Swim Skin , and HUUB Varga Goggles. I had a solid transition and once out on the bike course I was passed by Alicia as I was getting into my shoes. About a half mile later, I re-passed Alicia as I wanted to really push the start of the bike to create separation from the group that exited the water together (I believe there were six athletes). I maintained the lead in the bike of the next 23 miles and Alicia re-passed me just about a half mile before the transition. 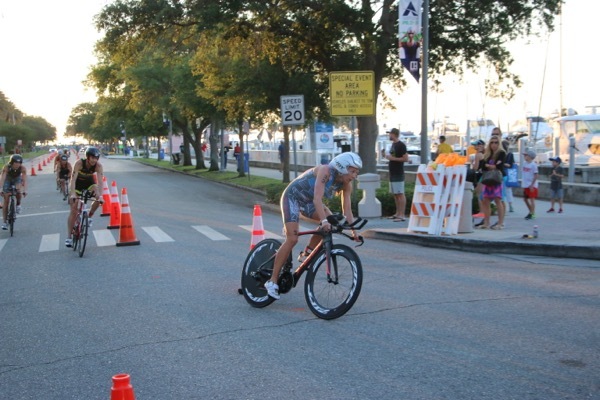 I did not have the best bike dismount; however, I was able to make up time in transition and exited just a few seconds behind Alicia. My bike gear that I used for the day was: Fuji Norcom Straight 1.1 with: Zipp Firecrest 808 tubular with Tangent SLSpeed Tires, Zipp Super-9 Disc Tubular, with Tangent SLSpeed Tires, Quarq Elsa R Power-Meter, SRAM eTap wireless components, ISM PS 1.0 saddle, Zipp Vuka Stealth base bars with ski-tip extensions, Speedfill Z4+ with the A2 Stem Mount, and the A2 system, Sampson Stratics Carbon Ti Pedals, and Rudy Project Wing 57 Helmet. Here is my Quarq Powerfile presented by Trainingpeaks. I pushed the first half mile of the run and then settled into a tempo for the next couple of miles. Alicia and I ran together and it was fun having someone to run with and bring out the best racing in me! Just after the half way point of the run, I decided to pick up the pace a little bit. Slowly over the next couple of miles, I extended my lead over Alicia. I felt good on the run and I wasn’t exactly sure how the body was going to respond after so much racing the past couple of months. On the run I used the following gear: Skechers GoRun4’s, Mission EnduraCool Instant Cooling Towel, T1Pro Transition belt, and Rudy Project Tryalx Orange Fluo Glasses!